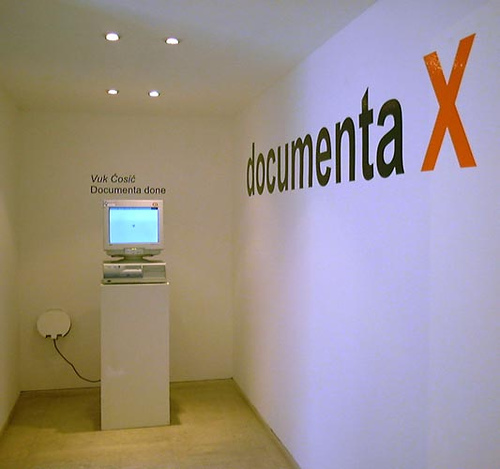 Documenta Done was an act of artistic piracy that highlighted net art’s uneasy relationship with institutions and archives. 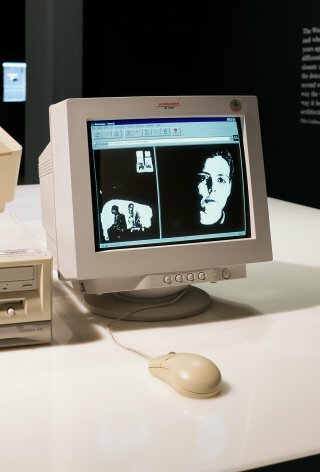 In the mid-1990s, a network of artists, including Ljubljana-based Vuk Ćosić, came together at conferences and on mailing lists to develop the concept of “net.art.” A number of these artists were involved in documenta X, the 1997 edition of the major exhibition held every five years in Kassel, Germany. 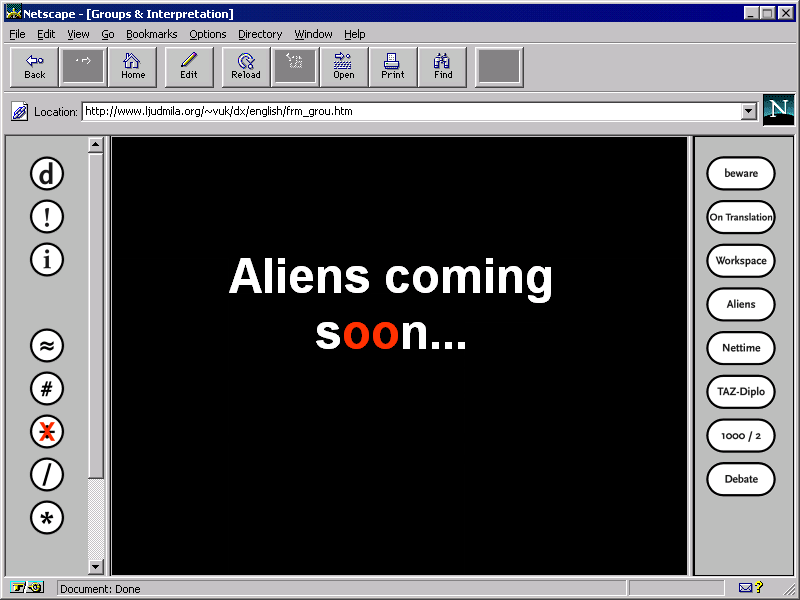 Following the exhibition, the news circulated that the exhibition’s website, which included browser-based art and online forums, would be taken offline and sold as a CD-ROM. 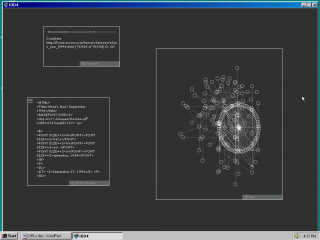 Ćosić quickly copied most of the documenta X site to his own server, Ljudmila.org, and circulated a mostly fake press release about his act, pinning the blame on an “Eastern European hacker.” An artistic ready-made and a prankish gesture of institutional critique, the copy of documenta X serves as a testament to the way in which meaning and memory are contested online, and the difficulties of adapting this informal process to an institutional context. Documenta Done perhaps has its origins in an event that took place the prior year in Trieste, Italy. Vuk Ćosić secured a small budget from the festival Teatro Telematico, and invited eight or so artists to participate in a conversation about net art. This project was called Net.art per se. There is no archive of the Net.art per se proceedings apart from recollections of the participants and Ćosić’s memorable website for the event. 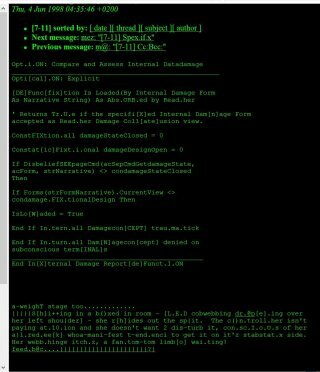 To make it, he had copied the source code from four sites of the time—CNN, Alta Vista, Yahoo, and Heath Bunting’s CyberCafe—and altered their content to address questions raised by net art practices. Vuk Ćosić, Net.art per se, 1996. 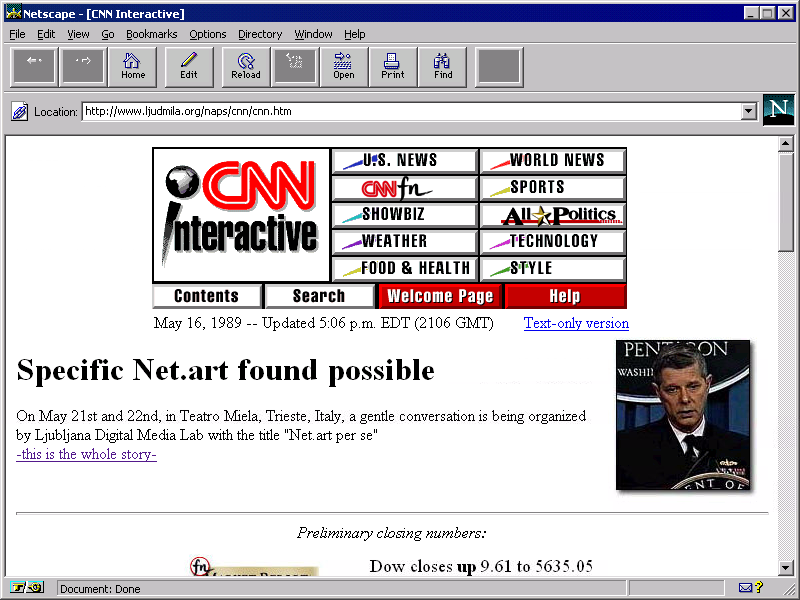 View archived copy of Net.art per se in Netscape 2. Read Caitlin Jones’s reappraisal of documenta X on Rhizome. 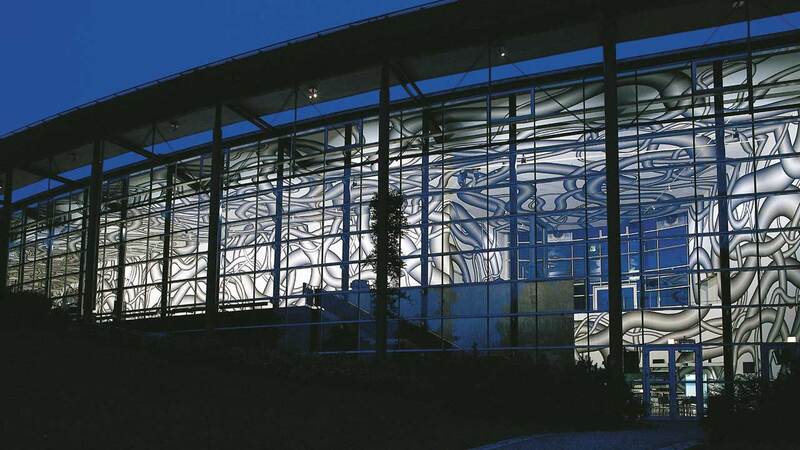 Exterior of documenta X showing work by Peter Kogler, 1997. Photo: Werner Maschmann. 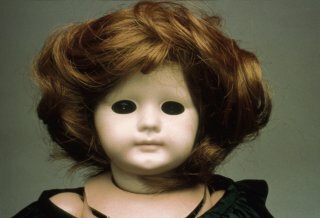 The event played an important role in promoting the idea of net.art as a cohesive avant-garde. The following year, documenta X featured net art in a range of ways: several works on view in a dedicated gallery, offsite projects such as the hyper-networked mobile home installation Makrolab, and an ongoing conference called Hybrid WorkSpace. 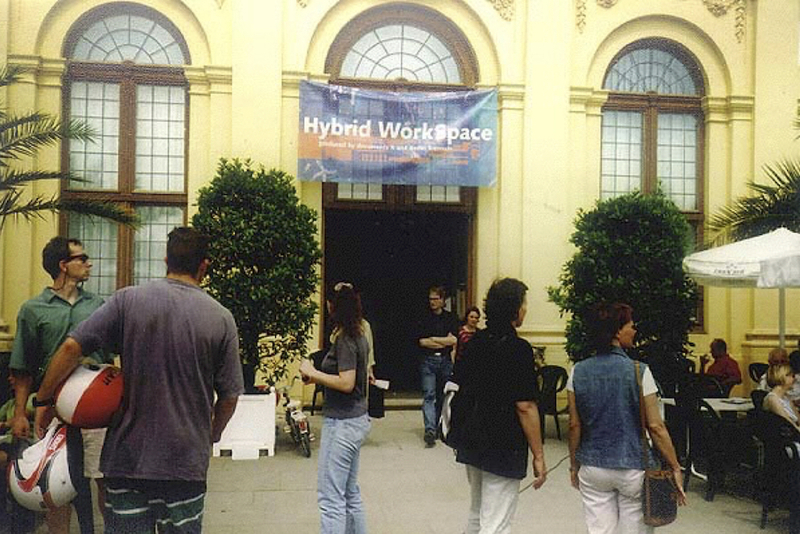 Exterior of Hybrid WorkSpace at documenta X, 1997. 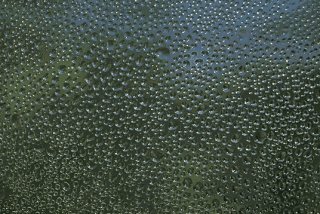 GIF by Vuk Ćosić made during a conference at the ICA, London, organized by Mute magazine. 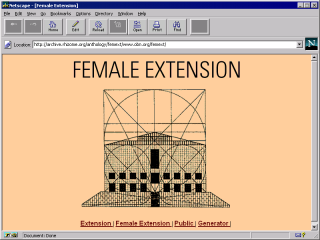 Net art section at documenta X, 1997, documenta-Halle, Kassel. Photo courtesy of Joachim Blank. 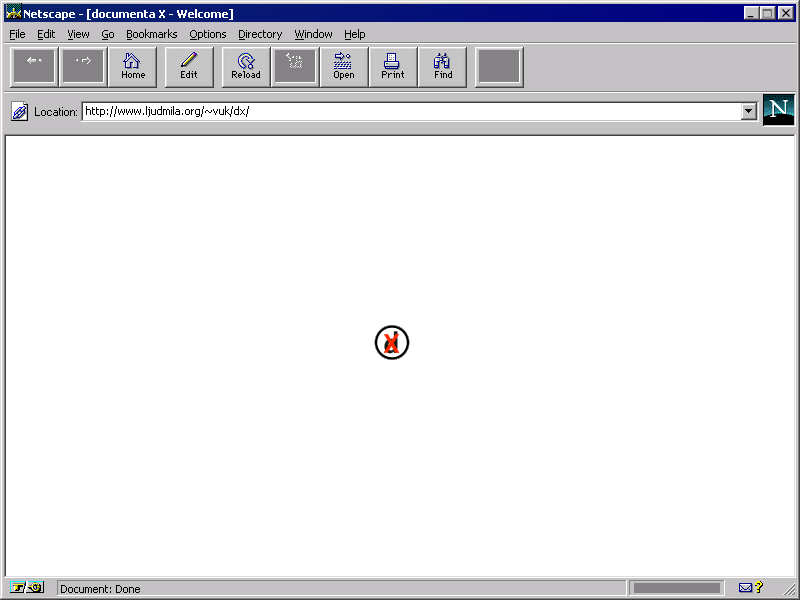 In this context, documenta’s decision to take the documenta X website offline and sell it as a CD-ROM registered as a problematic gesture of institutional control over net art's circulation. Read “Repo Man: Vuk Ćosić and the theft of Documenta X,” an interview with Vuk Ćosić by Michael Connor, on Rhizome. 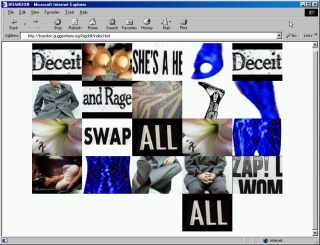 In response, Ćosić made a copy of the site, posted it to his server, and circulated an announcement under the headline “Eastern European Hacker Steals Documenta X Web Site,” describing his gesture as a “major international art theft.” The circulation of this news in the media, sometimes under the pseudonym Keiko Suzuki, was an important part of the project. Vuk Ćosić, Documenta Done, part of the exhibition “Net-art per me” at the Slovenian Pavilion of the Venice Biennial, 2001. Intended as a critique, Documenta Done also served an important archival function. It symbolizes the failures of institutions to facilitate social memory in the context of digital culture, and the way in which artists—often playing the role of pirates and hackers—have stepped into the gap. 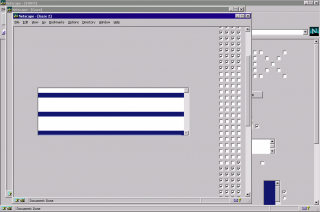 Vuk Ćosić is a pioneer in net art, net.art, and new media art, as well as hacktivism. 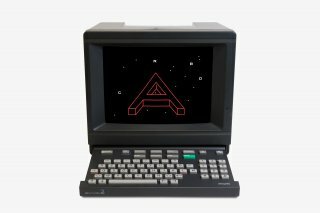 He co-founded Ljudmila—a digital media lab for artists in Ljubljana, Slovenia—as well as the ASCII Art Ensemble, Nettime, Syndicate, and 7-11. 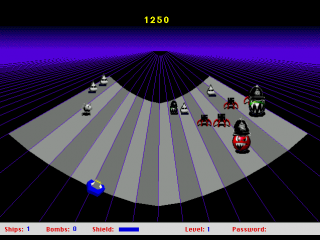 Ćosić is well known for running ASCII (American Standard Code for Information Interchange) variants of iconic film scenes thus transforming code, image, and pixel into a collision and immediate commentary. 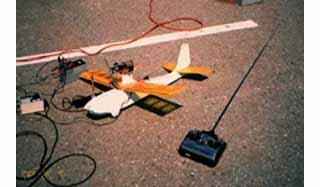 Exhibitions include Venice Biennial, MIT Media Lab, and many other museums and festivals internationally.